The southwestern most tip of Nova Scotia is renowned for its Acadian roots, colourful fishing villages, towering churches and the spectacular Cape Forchu Lightstation. 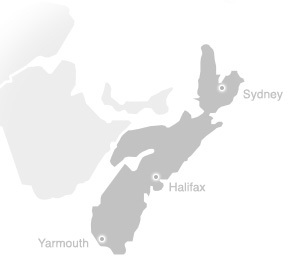 Yarmouth, located approximately 3 hours from Halifax, is the hub of this region. Just south of Yarmouth is Argyle Township Courthouse in Tusket, the oldest courthouse in Canada. To the north, tiny villages are overshadowed by lofty churches, such as Musée Église Sainte-Marie or St. Mary's Church, the largest wooden church in North America. The Acadian Shores have a history dating back over 400 years and contain French-speaking villages like Pubnico, the world’s oldest Acadian community. You can explore this deep history and genealogy at Le Village historique acadien de la Nouvelle-Écosse and Musée des Acadiens de Pubnicos. The Festival Acadien de Clare is a great way to experience the rich Acadian music and culture.The Festival Acadien de Clare and Rendez-vous de la Baie Interpretive Centre are great ways to experience the rich Acadian music and culture. Be sure to try out local culinary specialties, like creamed lobster and rappie pie. Yarmouth, Nova Scotia is the perfect starting point for two of our scenic travelways, the Lighthouse Route and the Evangeline Trail. Let the Lighthouse Route guide you along the South Shore, which follows shoreline roads past rugged, wave-carved headlands, tranquil island-studded bays, historic towns and weathered fishing villages where legends of the sea come alive. The South Shore region boasts over 20 lighthouses, from the Cape Forchu Lightstation in Yarmouth to the famous lighthouse in Peggy’s Cove. From the seaport of Yarmouth, the Evangeline Trail follows Nova Scotia's Fundy coast back through time to the earliest days of North American settlement. Enjoy picturesque French-speaking Acadian villages, visit Digby, home port of the world's largest scallop fleet and travel through the rich farmland, orchards and wine-country tapestry of the Annapolis Valley. Named after Longfellow's immortal epic poem "Evangeline: A Tale of Acadie", the Evangeline Trail takes you to the Grand-Pré National Historic Site where a statue of the fictional heroine can be found.